I just don’t get it. Why does one person cop multiple illnesses? And why does this seem to happen to the beautiful people? Later this week I will be travelling to Perth to meet my friend at the airport, after which we will spend two luxurious nights at a resort. During the days, I will take my friend to her medical appointments; in the evenings we will sip wine, eat pizza, and reminisce. She was the first kid to say hello to me on the bus to school after my family moved from PNG to Australia. Since then, we have had years of little contact due to busyness, geography etc. but, more recently, have reconnected. ‘How is it possible for you to still laugh?’ I asked her on the phone tonight, to which she replied with her laugh. My friend suffers severe eye conditions and an unhealed broken foot and yet she can still maintain laughter within her suffering. How does she do this? I haven’t mentioned her name because she is very private but I so wish I could salute her publicly because she is amazingly philosophical and pragmatic. And maybe she and I will make a bit of sense out of the suffering conundrum when we see each other in a couple of days. I can’t wait! Sorry about that image. Prince always seems to want to give me the back view. Here is a better view. Have a great time with your friend, loved the peacock too. How wonderful to have reconnected after all this time! I’m sorry your friend has such difficult health issues, but the fact that she is still laughing is a good indicator of what a strong person she is. I wish you both many laughs as you reconnect! She is as brave as you are my friend. Enjoy the break! In answer to your first question: there is no reason which makes it all the harder to bear. Perhaps laughter is your friend’s best medicine – it is amazing what a positive spirit can do. She sounds wonderful and I’m so glad for you having the opportunity to be with her. Enjoy! 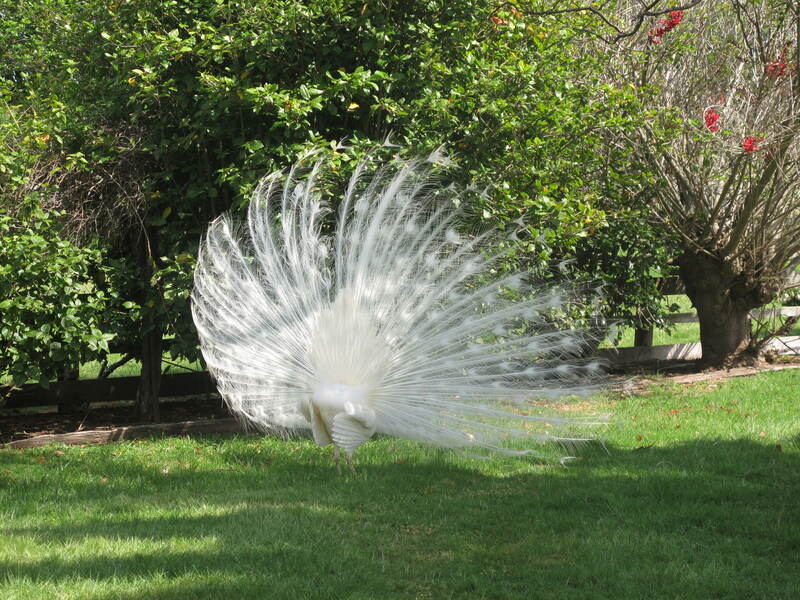 I’m sure she appreciates you – just like the peacocks who are “fans” of yours. 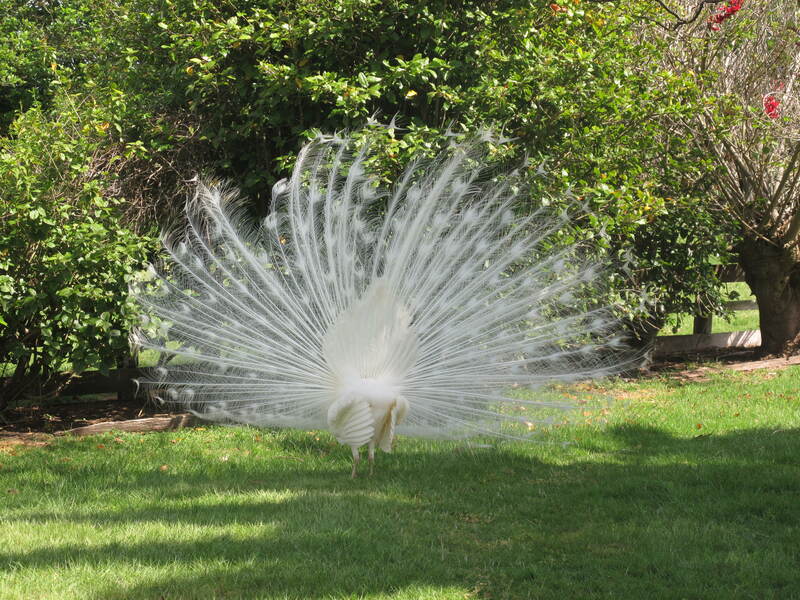 Wow – those feathers are gorgeous! It always is so great to see her. Hope you enjoy the time with your friend and I love the peacock image also. I even love the backside of peacocks. Their feathers always amaze me. (I wonder how why some of us seem to be plagued by numerous health complaints too. I mean to say, apart from my own current issues, I seem to have inherited all the serious health conditions from BOTH sides of my family. What bad luck is all I can say). I sure your friend will feel all the better for your Compassion, Wit and Fine Company on the trip. The wine was pretty good too! Sorry – Papua New Guinnea. ahhh I live and learn! Enjoy meeting your friend Julie. Love the photos. It was great Arlene – thanks! I think you are a great example of someone who accepts things as they happen. Prince seems to like his backside too! i am sorry to hear of your friend’s suffering. what i find interesting is you have suffered and managed to laugh and know as well as anyone that sometimes laughter is the only way to survive through the hard times. What an unbelievably courageous woman you are, Sandra! I hope you know how dear you are to me too!